Start South entrance to Galena Creek Regional Park on Highway 431, 7.3 miles west of I-395 North exit and 6.3 miles west of I-395 South exit. There are approximately 5 parking spaces near the entrance, which is located adjacent to the NDOT (Nevada Department of Transportation) Maintenance Station. An alternate end point is the north entrance to Galena Creek Regional Park on Highway 431, 0.3 miles north of the south entrance. Drive in the north entrance and park in the designated parking loop. 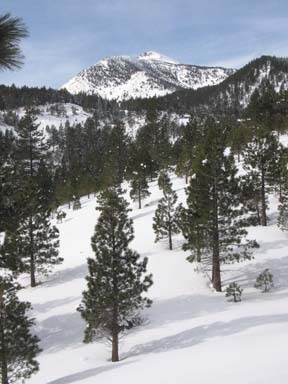 In days gone by skiers could climb up the old Mount Rose Highway, have lunch at the Christmas Tree restaurant, and then retrace their tracks or ski down the old Tannenbaum Ski Area to return to the starting point. This unique opportunity to ski and dine vanished when the restaurant was destroyed by fire and with it much of the charm of the tour disappeared. 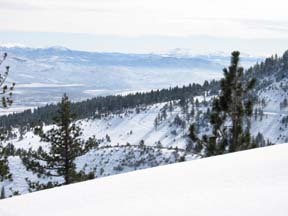 Nevertheless, you can still ski up and down the old highway and enjoy the views of Washoe Valley below and a glimpse of Mount Rose in the distance. However, along the entire distance you are within earshot of the new Mount Rose Highway. Skiing up and down the old highway is rated intermediate due to the continuous gradient on the narrow road, which limits maneuvering on the descent. As might be expected, the only good time to descend the road is with fresh snow or spring conditions. Keep in mind that powder on the old highway quickly turns to mush due to warm weather and sun exposure. The climb up the old highway is more worthwhile if you combine it with a return descent down the old Tannenbaum Ski Area, which was closed in 1981 or thereabouts. This is an opportunity to carve some turns on a north-facing slope. It is also rated a notch more difficult than simply returning down the old highway. Regardless of whether you ski the loop or return via the old highway, this tour is best skied during or immediately after a cold storm because of its low elevation — it ends at only 6250 feet. The Old Tannenbaum Ski Area tour describes the one-way tour down the old ski area. From the trailhead (1) at the south entrance to Galena Creek Regional Park ski around the back side of the NDOT Maintenance Station and then follow the snow-covered old Mount Rose Highway for a total of 1.9 miles until you intersect the new Mount Rose Highway (2). During much of the distance you have views of Washoe Valley below and near the end you have a stunning view of Mount Rose (10, 776 feet). Retrace the route for 1.9 miles back to the trailhead (1) or continue on the loop tour described below. Loop north and then west while paralleling the new Mount Rose Highway for 0.4 mile until you reach the top of an obvious ski run (3) where a ski lift ran straight up and down the slope to the north. Descend the old ski run north for 0.3 mile until you reach a water tank (4). Pass the water tank on its east (right) side and descend northeast for 0.6 mile until you reach the NDOT Maintenance Station at the south entrance to Galena Creek Regional Park (1). In this section you should stay above the houses and the road to the houses you will encounter. As an alternative you can walk down the plowed road in the park to reach the end point. Finding the route from the alternate start point at the north entrance to Galena Creek Regional Park to the south entrance and the NDOT Maintenance Station is not easy to describe or easy to follow because the lay-of-the-land is non-descript and the area is often trampled by snow-players. Here is the best advice. From the restroom facility at the north entrance trailhead (5) begin by skiing southwest and then turn south for a total of 0.5 mile until you reach the bridge across Galena Creek (6). 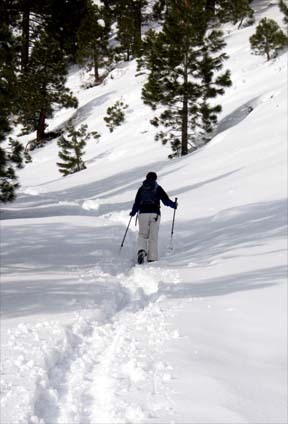 The route follows the Bitterbrush Trail that is poorly marked at best, however, the route is often well trampled by snow-players. Much of the trail is either a wide trail or road. Cross the bridge and ski east for 0.1 mile until you reach the NDOT Maintenance Station (1) where the main tour description begins. If you are returning via the defunct Tannenbaum Ski Area there is no need to ski back to the NDOT Maintenance Station if you are headed to the north entrance trailhead. Locate the south entrance kiosk approximately 0.1 mile before reaching the maintenance station and then ski northwest for a short distance (approximately 0.05 mile) to the bridge across Galena Creek. Then retrace your route back to the north entrance trailhead.